BBQ Concepts of Las Vegas, Nevada has another amazing Traeger recipe for you from the brilliant chefs over at Traeger Wood Fire Grills. There’s no shortage of mouthwatering recipes coming from them. 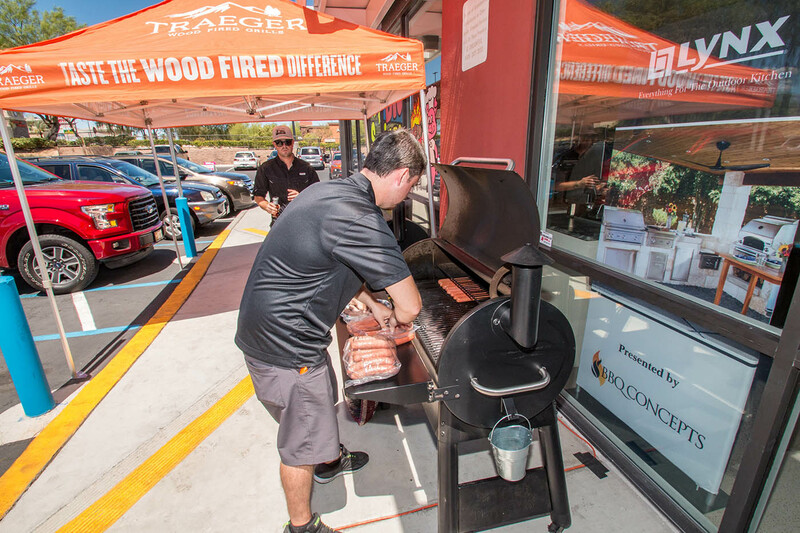 Here at BBQ Concepts, we support the Traeger brand of easy to use wood pellet smokers. If you’d like to learn more, we invite you to stop on into our showroom on October 28th, 2017 for an in-store demo. Traeger will be there all day demonstrating how to use their amazing line of Smokers. We can’t wait to see you there. Dip into rich, smoky Traeger-roasted salsa and watch the bowl do a disappearing act. Cut bell peppers, tomatoes, jalapenos, garlic, and green onion so the inside is exposed. Place directly on the grill for 2 minutes. Turn the grill down to 275 degrees F and roast vegetables for 1 hour. Place roasted vegetables, cilantro and lime juice in a blender container and puree until smooth. Serve with chips or on your favorite dishes. Enjoy!